Ramkishan completed his 12th standard from rural area near Gwalior in Madhya Pradesh. His family consists of five members including his parents and siblings. He was very disappointed when he had to discontinue his studies due to financial restrains in his family. He was very confused about his future but wanted to do something for his family. 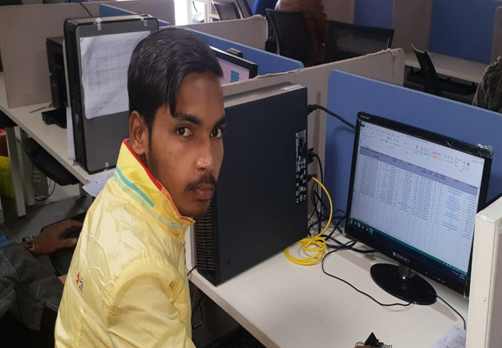 A team of moblizers met him while doing the outreach activity at his place and shared about the free skill training provided by Don Bosco Tech in Gwalior.Ramkishan came to the centre and enrolled in the Domestic Data Entry Operator course as per his interest. During the training, he was one of the ambitious and regular trainees at the centre. He was always willing to learn new things. He also participated in a number of programs organized at Don Bosco Tech. The training program helped him to gain new dimension in his life and develop self confidence. Now his view towards life got changed in a positive manner. After the training, Don Bosco Tech provides him chance to be interviewed in Karvy for Domestic Data Entry Operator domain, where he performed well and got selected in first round and getting 8800/- Rs per month as salary. He is very much thankful to Don Bosco Tech who changed his life completely and feels lucky to join Don Bosco Tech.